Tweedales and Smalley of Globe Works, Castleton, Rochdale, a well-known and international brand in the textile machinery industry. 1891 The birth of what was one of Rochdale's major firms was prompted by events in another town. When John Bullough, of Howard and Bullough in Accrington, died in 1891 three of the company's executives decided to set up business on their own. Brothers Edmund Tweedale and Samuel Tweedale and Joseph Smalley each put £10,000 into the venture which became Tweedales and Smalley. Each had a great deal of expertise in the industry due to their positions at Howard and Bullough - Edmund Tweedale being works manager, Samuel technical manager and Joseph Smalley sales manager. Work began in a rented building on John Street, Rochdale, near to Orr's Mill. There the patterns for the machines they were going to construct were made. By July 1892 they had started moving into the new Globe Works, the layout and buildings having been designed by Samuel Tweedale. The firm swiftly gained a reputation in the engineering world for advanced design and workmanship and the high standard of its machine tool equipment. Refusing to be restricted by existing methods or equipment, its innovations became one of its main strengths and its machinery was much sought after. In February 1893 its first spindles were running at the Newhey Spinning Mill and the same month it completed its first machine - a ring frame. 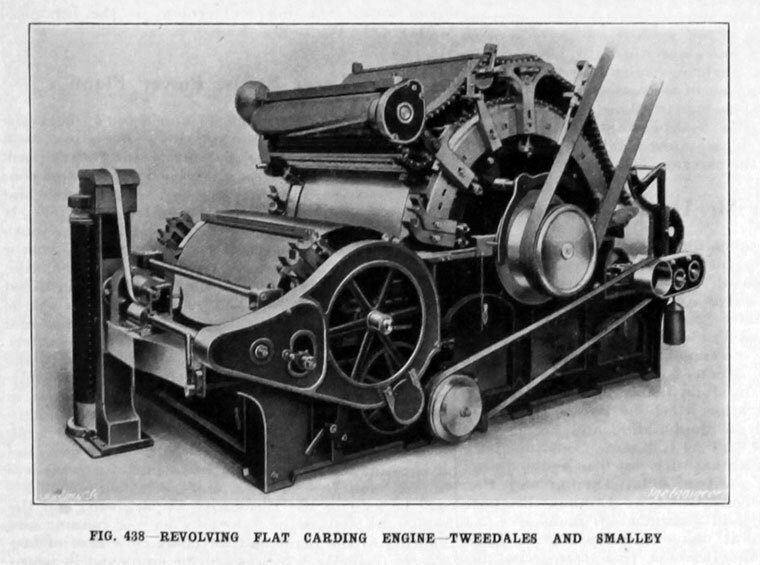 Tweedales and Smalley were prompt other machines. The first speed frame was delivered to John Bright and Brothers in August of 1893 while its first drawing frame was produced in February 1894, followed by the first revolving flat carding engine in 1895. Its market spread overseas, with India being a particularly big customer. At one stage half of all the textile machinery in India had been made by Tweedales and Smalley. As demand for its products increased over the next 20 years the company had to expand both its premises and workforce several times until it covered a large area of Castleton. 1912 Constantly adding to its range of products, it began producing blowing room equipment in 1912. That same year Edmund Tweedale died. 1913 Always keen to keep up with the latest gadgets, the firm had the first automatic phone in the country installed at the Globe in June 1913. WWI When the First World War broke out Tweedales and Smalley produced armaments, but its war work was hampered by two major incidents. The first, in May 1916, was an explosion in the electrical department which killed six people. Next, in March 1917, came a strike which broke out over union recognition. Samuel Tweedale and Joseph Smalley resisted the workforce and both sides dug in. The war effort was disrupted to such an extent that questions were asked in the House of Commons and a government official visited the works. Eventually the company founders were forced to give in. 1920 Seeing the need to hand over to the next generation, in 1920 they accepted a bid of £450,000 from a syndicate formed in Rochdale and Tweedales and Smalley became a public limited company Tweedale and Smalley (1920) Ltd. Initially members of both families were on the board but by 1926 the only one remaining was Walter Tweedale, who became managing director. Joseph Smalley died in 1922 and the remaining founder, Samuel Tweedale, passed away in 1928. The 1920s and 1930s were tough times for the company as the domestic market all but dried up, forcing it to look increasingly overseas. Any further expansion had to be shelved as it concentrated on fighting off increasing competition. One of its main weapons was salesman Joe Norris. His sterling efforts meant that between 1920 and 1940 the firm received 59 orders for plant from India and a number of contracts from Russia which together ran into a seven-figure sum. 1931 several rival firms merged to form Textile Machinery Makers and the organisers wanted Tweedales and Smalley to be included. Undecided, the directors left the matter in the hands of the shareholders, who rejected the idea. Even so, the following year Platt Brothers of Oldham, the ultimate owners of TMM, acquired 51 per cent of the share capital. WWII: During the Second World War the company again produced armaments, mainly incendiary and high explosive bombs, though this time without the unrest of the previous conflict. When peace came the company faced another major challenge. With the domestic market still in a poor state and India beginning to manufacture its own machinery, Tweedales and Smalley was forced to look elsewhere. Once again it rose to the challenge and between 1945 and 1950 exported to 28 different countries. China was one of its major customers while the firm did a lot of trade in South America - namely Peru, Brazil and Mexico. It also did work in West Africa, Germany, Portugal, Persia, Turkey, Norway, Sweden, France and Holland. The firm was well-equipped to carry out this export drive, having undergone a complete modernisation of its works during the war. 1957 the firm became a wholly-owned subsidiary of Platt Brothers Holdings but retained its identity. 1959 The company gained contracts worth more than £900,000 to supply machinery to Yugoslavia, Israel and Australia. It was also due to undertake the manufacture of a wide range of industrial and marine air-conditioning equipment. As the 60s opened, however, a number of redundancies prompted rumours that the factory would be going on short time. 1962 The Globe works - and thus the firm itself - would shut by the end of the year. At the time it was described as one of the town's biggest industrial shocks since the turn of the century. The official statement from Platt Brothers said that due to a drop in the demand for cotton spinning machinery it would be concentrating operations at its Oldham plant and Howard and Bullough of Accrington - ironically one of the final chapters of Tweedales and Smalley being written by the firm where the story had begun. For 18 months after the closure, the future of the Globe works lay in the balance. At one stage Rochdale Corporation considered buying it to as a drive to provide premises for firms wanting to set up in Rochdale. This page was last edited on 21 March 2019, at 11:30.